3 Simple tricks to make your Einstein Analytics Visualizations more meaningful. The old adage “a picture is worth more than a thousand words” is true but if the right visual representation is not used, it becomes misleading and difficult to interpret. The following use cases explain some misrepresentation scenarios and then suggests solutions to fix them in Einstein Analytics. Most visualization tools just ignore the missing value by joining the data points corresponding to the neighbors of the missing value. But this gives an impression that nothing is wrong with the data which can actually be false. Image 1: Timeline Chart with missing value for 2012. Data points for 2011 and 2013 are joined. Image 4: Timeline Chart indicating a data value for an incomplete time period. While visualizing data, many times we come across situations when the difference between the highest and lowest value of a grouping is very high. For example: In the column chart below, [Image 5] the data values for ‘Water’, ‘Buttermilk’ and ‘Wine’ are very small compared to ‘Coffee’. This makes the size of the bar for the former 3 very small which in turn makes it difficult to compare among them and also very hard to click on the bar for the dashboard to facet. Image 5: Column Chart showing wide variations in highest and lowest data values. A good solution to this problem is to show 2 graphs. The first one would be the same as the above image and would show the complete picture. The second graph would just zoom in on the smaller data values. Both these graphs could be placed adjacent to each other to showcase the data more effectively. Image 6: Two Graph solution for a Column Chart with wide data variations. 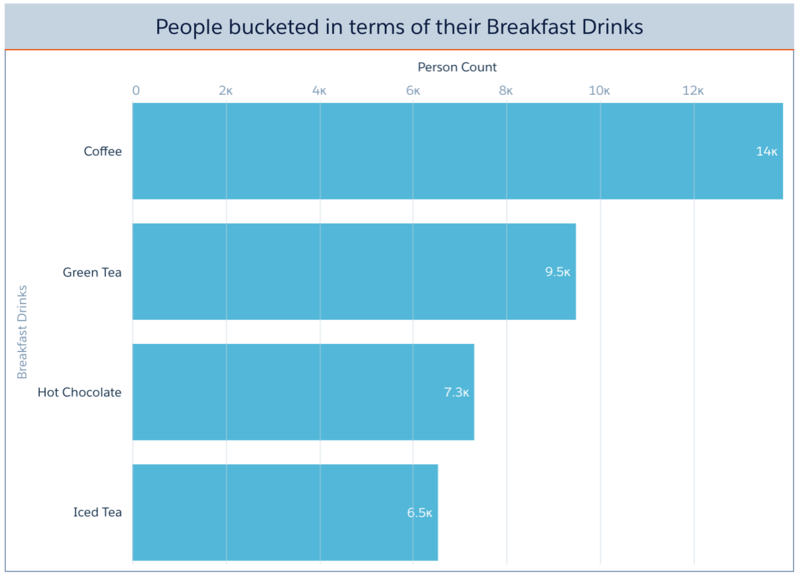 Width of a Bar in a Bar Chart – How does it matter? A bar graph encodes values by showing variations in its length. The width of the bar or ratio of length to width should be such that it makes it easier to look at the length of the bars, it’s values, and compare them. Excessive width distracts attention from the lengths of bars, wastes space, and simply does not look good. Two graphs with bars of the same length do not seem the same if the bars in one are much wider than the bars in the other. Note: In the visualizations below, width refers to the vertical thickness of the bar (on Y-axis) and length is shown on the X-axis. Image 7: Bar Chart Properties: Auto Fit = Fit leading to thicker bars which seem to distract attention from length of the bar. None: The width of the bar remains fixed irrespective of the number of bars and the space assigned to the widget. Fit: All the bars will fit in the allocated widget space. If there are many values for the dimension, each bar would become very thin but would still fit. If there are very few values for the dimension, the width of the bar would increase and so will the spacing between them. Preserve Labels: The name of the grouping value will always be shown. If there are few values for the available space, the bar width would increase and so will the spacing between bars. If there are many values for the dimension, a scroll bar will be added after reaching a point beyond which the bar width cannot be decreased without affecting the grouping value names. Using the above discussed tricks will help send out the right message to your dashboard viewer and can add a lot of gravitas to an analysis. Clearly a nice arrow to have in a Data professional’s quiver! If you found this post interesting or helpful, please share it with your network. Happy Reading.